The Crow was a massive hit when the comic book tale was eventually released in May, 1994, but sadly, its star was no longer here to witness its success. The Crow is a dark, brooding, gothic, action filled meditation on revenge, justice, love, and the afterlife, strengthened with bits of dark humor and a haunting performance by the late Brandon Lee, who was tragically killed in an on-set accident. The Crow is remembered for Lee's brilliant portrayal of the movie's hero, musician Eric Draven, who returns from the dead to extract revenge on the Motor City thugs who murdered both him and his fiancé. A supernatural bird guides Draven through Detroit on Devil's Night, one year to the date after crime kingpin Top Dollar ordered his henchmen to kill the soon to be wed young couple. One by one, Eric makes his way through Tin Tin, Funboy, T-Bird, and Skank, until finally going up against the big bad himself. Today we look at 10 things you never knew about The Crow. Brandon Lee was not the first choice for the lead. The movie's cast is a perfect storm of awesome. Gravely voiced bad guy Michael Wincott; Bai Ling, as his half-sister and lover; Ernie Hudson from Ghostbusters; David Patrick Kelly from The Warriors, 48 Hours, Commando, and Twin Peaks; Laurence Mason, who we later saw in TV's The Shield and Prison Break; Angel David; and two great actors who we lost in 2016: Michael Massee, as Funboy; and Jon Polito, who played the creepy and curmudgeonly pawn shop owner Gideon. But The Crow is rightly most identified with Brandon Lee, the 28-year old son of martial arts legend Bruce Lee, who died when Brandon was just eight years old. Brandon starred in the made for TV Kung Fu: The Movie and the pilot Kung Fu: The Next Generation, the Hong Kong action film Legacy of Rage, and the low-budget Laser Mission. But he really came into his own opposite Dolph Lundgren in the camp action classic Showdown in Little Tokyo and even more so in Rapid Fire, an action movie that put Lee's charisma, action chops, and great smile firmly in the lead. 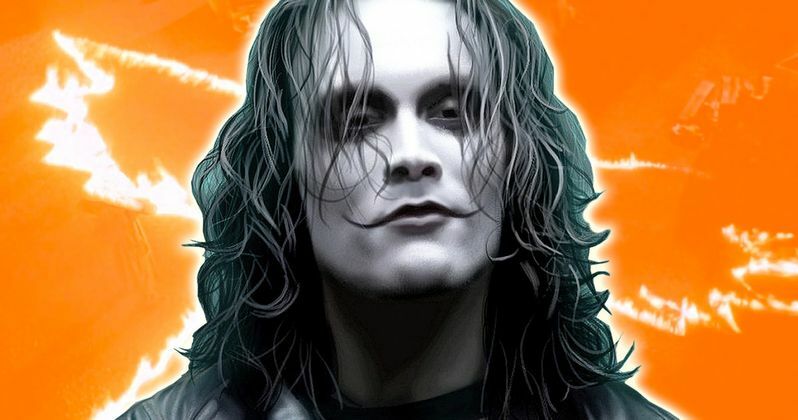 The Crow would have been Brandon Lee's big break, stepping away from martial arts heavy roles so intrinsically linked to his famous father and giving the world a new comic book hero, torn from the pages of creator James O'Barr. But Brandon Lee was not the first choice for the lead. In an in-depth oral history presented by MTV's comic book centric Splash Page blog a few years ago, producer Jeff Most and writer John Shirley revealed some of their early casting ideas. Shirley said he pushed hard to see Christian Slater as The Crow. At the time, he'd already made Heathers, Pump Up the Volume, and Mobsters. Producer Ed Pressman wanted to reach out to '80s hair metal rocker Jon Bon Jovi, who did later make a few movies. Rumor has it that Johnny Depp was another potential Crow discussed by producers. But Most told MTV that Brandon Lee was the only actor to receive a formal offer. "It was a bit of a risk because he wasn't a big star name," he admitted. "Brandon embodied everything we were looking for in this action hero who is an athlete, musician, lover, romantic. And he certainly delivered in spades." Brandon Lee's commitment to the role was complete. Lee's commitment to his roles was always complete. He was heavily involved in fight coordination and stunt work on Rapid Fire and carried that work ethic to The Crow. The bigger physique movie audiences saw in Rapid Fire was gone by the time Brandon Lee showed up to the set of The Crow in North Carolina. Lee lost about 40 lbs. in order to give Eric Draven the more lithe, sleek, and shredded look he wanted. As Most explained to MTV: "He had gone to the hospital on every movie, because he was always trying to push the envelope. He wanted to push himself physically and what could be accomplished on film. He embodied the spirit of his father in trying to reimagine how one can put action onscreen intelligently, with substance. Devil's Night is a real thing. The Crow takes place in Detroit on Devil's Night, which is the evening before Halloween. While the Detroit we see in the film is fictionalized, the whole Devil's Night thing is in fact all too real. The Devil's Night concept in Detroit goes all the way back to the '40s but really picked up steam in the '70s and ran rampant all the way into the '90s. While criminal acts of vandalism and the like take place on "Mischief Night" around the country, Devil's Night is generally associated with the Motor City, where hundreds of acts of arson would result in massive fires all around town. Years after The Crow, Eminem's Detroit based hip-hop crew D-12 released a song called "Devil's Night." It's of course the perfect setting for The Crow, but dangerously destructive in real life. After one particularly awful Devil's Night in 1994, the city came up with a new official event called Angel's Night, where the community works to prevent violence. Since the advent of Angel's Night, the night before Halloween has been much more chill. James O'Barr's comic book features a character called The Skull Cowboy, who was originally intended to be in the film, as well. The Skull Cowboy served as an otherworldly guide for the movie's resurrected avenger, tasked with much of the story's exposition. Skull Cowboy is there when our hero is resurrected, laying down the ground rules for Eric's mission, seeming invincibility, and potential weaknesses. Veteran character actor Michael Berryman, whose facial features are so striking and familiar in cinema classics The Hills Have Eyes, One Flew Over the Cuckoo's Nest, and Weird Science, wore heavy prosthetics to play Skull Cowboy. He would have had a handful of confrontations with Eric throughout the film, reminding him of his mission to take out the people who had killed him and his fiancé without interfering with the affairs of the living. During the fight with Funboy, which was originally longer than what ended up in theaters, Eric was slashed with a razor and bled. Skull Cowboy explained that this was because he'd strayed from his mission when he helped Darla by squeezing the morphine from her arm. The electrical tape we see Eric wearing for the rest of the film? He put that on to cover those wounds. Toward the movie's climax, Skull Cowboy would have warned Eric that in saving the young girl Sarah, he would now be cursed to walk the Earth, rather than returning to the afterlife with his beloved Shelly. Michael Berryman was all over MTV screens in the '80s thanks to his starring role in the music video for Motley Crue's "Smokin' in the Boys Room." Observant fans and critics have noted the music video atmosphere, vibe, and feel of The Crow. That's no accident. Australian director Alex Proyas, who at the time had only one small feature film under his belt, came from the world of music videos. As a music video auteur, he directed clips for his fellow Australians INXS and Crowded House, among others.